Whether it’s correspondences from soldiers in Afghanistan, young mothers, teachers, teenagers, naval submarine officers, firemen, corrections officers, cancer survivors, nurses, the elderly, prominent businessmen or distinguished doctors, thousands of letters confirm that inspirational columnist and bestselling author Catherine Galasso-Vigorito has the ability to encourage, inspire and comfort her readers. 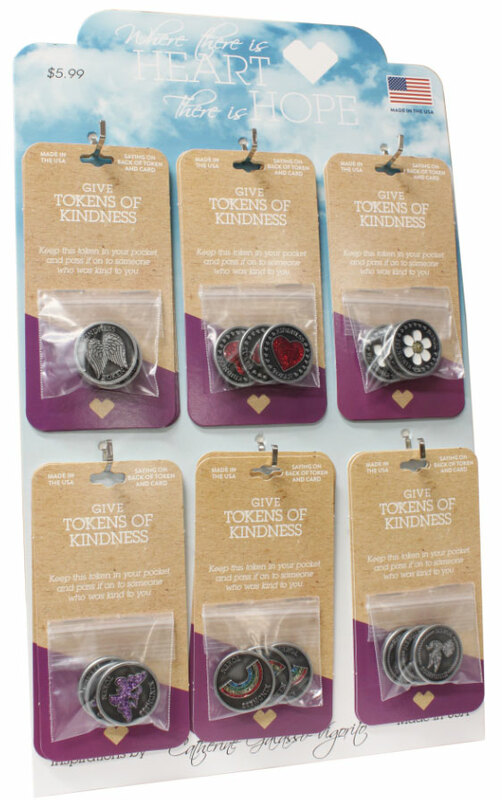 Catherine’s inspiration is now reflected in her new product – Tokens of Kindness– manufactured and distributed by Gloria Duchin, Inc.
Tokens of Kindness are debuting in select CVS stores nationwide this month, but you can also go to GloriaDuchin.com to purchase them now. “My mother was the epitome of kindness,” says Catherine, a mother herself now of three daughters. “Always be nice to everyone,” she would tell me, “Treat others with kindness,” Catherine recalled. 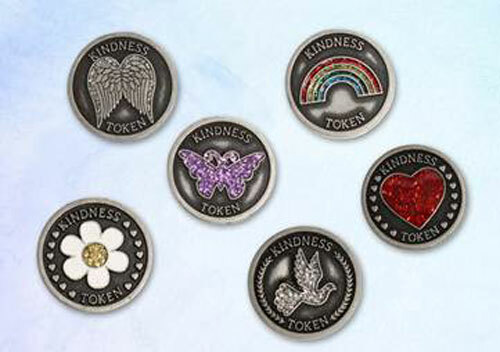 Keep this token in your pocket and pass it on to someone who was kind to you! In 1979, after years of working in the engravable gift market, Gloria Duchin founded Gloria Duchin, Inc., a seasonal design and manufacturing business. She created a collection of beautifully hand-crafted ornaments and gifts, accenting select styles with Swarovski® crystals and glitter. Today the company has over 100 million copyrighted ornaments in circulation. The immense popularity for Gloria’s ornament designs helped the company grow, and eventually, Gloria enlisted the help of her daughter, Robyn Smalletz. Robyn, a marketing executive in New York City joined the company, leading the sales and marketing efforts and evolving the business into a trend and design focused company. As President, Robyn began maintaining a close watch on trend and color themes in areas of fashion, giftware and home decor, applying her findings to new keepsake designs and producing an annual trend book. Because of her seasonal design work, she has been featured in the New York Times, Woman’s Day Magazine, XM Satellite radio, and most recently on the nationally broadcast World’s Greatest Program. Today, the domestically and 100% female-owned company continues to produce high-quality, exquisite keepsakes, jewelry, and accessories that are guaranteed to preserve precious memories for years to come.